I’ve while been hanging in cafes a lot lately, carving as much as I can with the free time I have. A few weeks ago, I was doing just that at Alex’s cafe, where he just so happened to be hosting a brunch event for our friends. One friend saw me working on my stamps and came by to look through my stampbook. I delightfully accepted, considering it something to do for fun. But, being a kind friend, she insisted she pay me some money for it (never really discussed how much, but meh! I’m happy to do it!). And thus, my first casual commission was born! Yay! 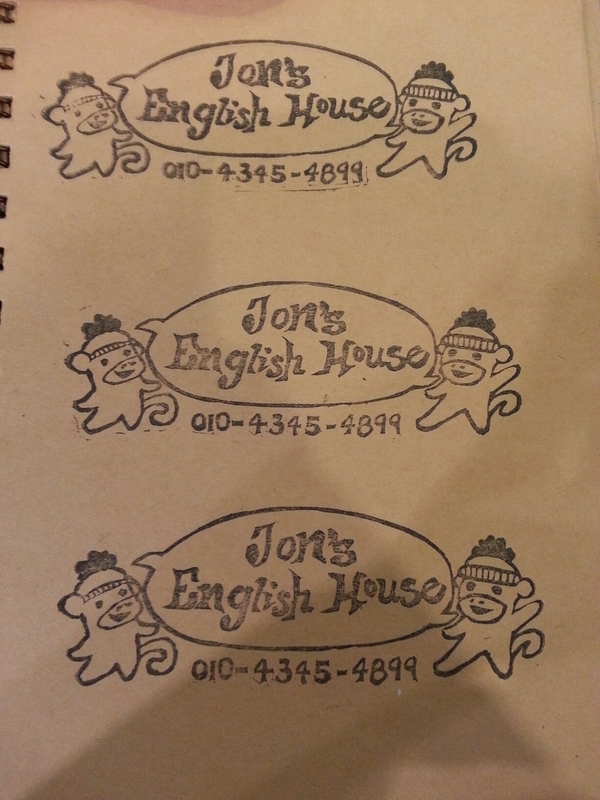 The project: design a cute stamp for her in-house English hagwon. The whole process was super laid back – a.k.a. I had no idea what kind of design they wanted and they were just like, “Sure, whatever you think’s best!” I decided to go with sock monkeys, since that’s a class project they’ve been working with their students. I needed sock monkeys, an element of conversation, and room for a phone number. Here’s what I came up with! It’s about 10 x 4 cm. Perfect for stamping onto letterheads and notebooks! [A]t the end of the day, they asked for something you could make because they appreciate your stuff. That means they think it’s worth something. Wise words! (With plenty more useful things said in our conversation, here uncopied). So, artists, how do you go about charging commission? What do you think is fair to charge a client? A friend? This stamp was cut from a block of rubber that cost $7, came to fruition after about 2 hours of sketches and drafts, and another 2 hours of carving time. Marta and I both agreed that $30 would be the absolute minimum for a custom piece like this. Pricing is the worst part of art for me. But in all truth who would refuse $30 for a personalized stamp? If you take a minimum wage of $10/hr (more or less depending where) x your 4 hours work on it and add the supply cost of $7 it comes out to $47. So $30 is a bonus price…for a very unique stamp. Which is super well done and so cute!